There are many types of variable rate mortgages available on the market such as a standard variable rate or a tracker rate. An alternative to the popular tracker rate is the discounted rate mortgage. What is a discounted rate mortgage? A discounted rate mortgage is a type of variable rate mortgage. Discounted mortgages are called such because they follow a certain level (a discount) below the lenders own Standard Variable Rate. This means they are very similar to tracker mortgages that are a certain level above the Bank of England Base Rate [BoE Base Rate]. The lenders' standard variable rate usually follows BoE Base Rate and has a guarantee that it will be no more than a certain percentage above Base Rate. Lenders use their own standard variable rate as opposed to BoE Base Rate as it allows them more control over interest rates as they can delay interest rate decreases for a short time therefore gaining a small benefit before passing the lowered interest rate to its customers. This can also work the other way and lenders may delay interest rate increases from the BoE Base Rate therefore giving you more time on the lower interest rate. The lender does not necessarily have to alter their standard variable rate by the same amount that BoE Base Rate changes, however they must ensure they stay within their Base Rate Guarantee. For example; if BoE Base Rate increases by 0.25%, some lenders may increase their Standard Variable Rate by 0.2%, some by 0.25% and others by 0.3%. It all depends on how the lender is positioned financially. 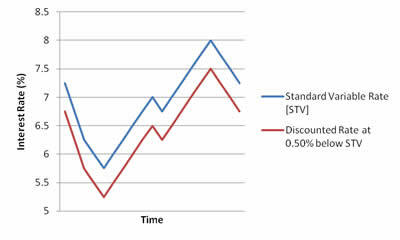 There is typically not a huge difference between the interest rates of tracker and discounted rates. The difference being more to do with the timing of interest rate changes rather than amounts. There is also a psychological element involved in the sales of discounted rate mortgages. Whilst the interest rates will be fairly similar, it sounds better quoting a rate as a discount. e.g. Standard Variable rate - 1.5% sounds more appealing than BoE Base Rate + 1.5%. For more information about 'Discounted Rate Mortgages', you can call us on 020 8783 1337 or submit an online quote.